Although summer in Athens began in June, on average the weather reaches its highest temperatures in July. The average temperature this month is 27°C (81°F), while the average low is a warm 22°C (72°F), and the average high is a stifling 32°C (90°F). The weather in July stays relatively constant throughout the month. July begins with lots of sun, no threat of rain, and an average daily temperature of 25°C (77°F). The middle of the month continues to produce sunny days with no rain, and an increase of the average daily temperature to 27°C (81°C). The end of July brings weather that is the same for the middle of the month. The lowest ever recorded temperature in Athens in July is 16°C (61°F), while the highest ever recorded temperature is 42°C (108°F). Just as the two months prior to it, July sees the highest average of daily sunshine in Athens for the year at 10 hours. The warm temperatures and high amount of sun create good conditions for visiting the beach, which is a popular activity this month. A miniscule amount of rain also makes for good beach days, and in July the average rainfall is just 10mm, happening over the course of only one day. Although the temperatures reach their peak in July, they fortunately are not accompanied by an increase in humidity. The average humidity this month is just 50%, which is comfortable and unnoticeable, although temperatures this month can be hot enough on their own to create discomfort. There is also an average of zero snow/fog days in July. Athens Habitat Apartments offers apartment-style living, with the amenities of staying at a hotel. They have several types of rooms to choose from, and have a few sites located around Athens. All of their rooms come with breakfast, air-conditioning, wireless Internet, and a kitchen area. Lunch and dinner can be ordered to the room as well. There is also a fitness center on-site, as well as a body treatment area offering massages, reflexology, and yoga classes. They are located about a 15 minute drive from the city centre. Grand suite at Athens Habitat, Athens. In 2007 The Athens Gate Hotel was fully renovated and now has 99 rooms over seven floors. All rooms come with air-conditioning and wireless Internet, while the front-facing rooms have views of the Temple of Olympian Zeus, and certain rooms on the back of the hotel have views of the Acropolis. The hotel has a rooftop bar and restaurant offering stunning views, as well as a bar/cafeteria located in the lobby. They are located about a 12 minute walk from the city centre, and just 100 metres away from the Acropolis Museum. Artwork Description The Temple of Olympian Zeus in Athens, Greece, Europe. What is the weather during April in athens greece? · wet winters and hot, dry summers. · cold, damp winters and hot, dry summers. 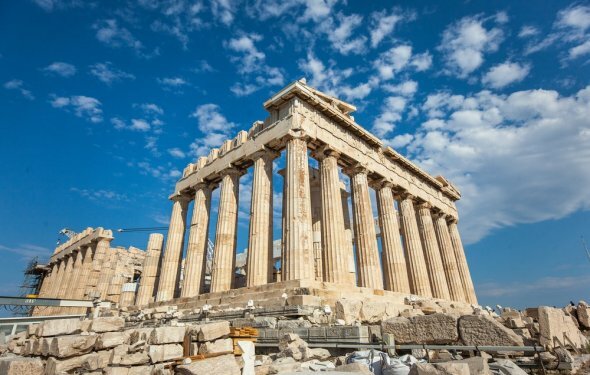 What is the weather like in athens, greece? Right now it is lightly raining in Athens, the temp is 45F. Tomorrow it will be 63F and sunny. !